Limelight’s cache efficiency is among the highest in the industry, and Limelight’s origin shield capabilities are a key reason. Limelight’s origin shield helps increase cache hit efficiency and reduce calls to your origin by assigning one or more Limelight PoPs (Points of Presence) to act as a proxy for your origin. 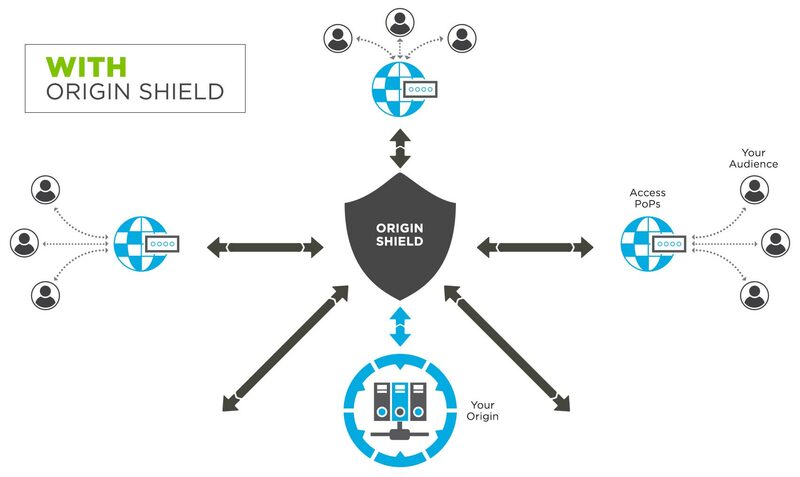 Origin shield can improve a wide range of workflows in both Limelight and multi-CDN environments. Example use cases include live video streaming, video on demand, website and application acceleration, file download for software and game updates, small object delivery and more. In a traditional CDN caching configuration, when a PoP receives a request for content that is not in cache, the content needs to be retrieved from the origin server. This can lead to thousands of calls that can potentially overwhelm the origin. Limelight origin shield reduces requests to origin servers and increases cache hit efficiency. When a Limelight PoP receives a request for content that is not cached locally, it will first request the content from one or more designated origin shield PoPs. If the content exists in one of the origin shield PoPs, it will be retrieved and delivered to the requesting PoP over Limelight’s private backbone. Only if the content does not exist in the cache of the origin shield PoPs will the request be forwarded to origin. This greatly reduces requests to origin, minimizes origin egress costs, and improves user experience. Limelight origin shield is a powerful tool in a multi-CDN workflow to reduce calls to origin from the multiple CDNs. By designating one or more Limelight PoPs to act as the proxy origin for all of the CDNs, large multi-CDN video streaming workflows can be supported with a single request to origin. Fast transit over Limelight’s private backbone minimizes latency before handoff to other CDNs. Limelight origin shield provides the simple scalability to support the largest multi-CDN workflows. Learn more about how Limelight Networks integrates a massive global private infrastructure, advanced content delivery capabilities, and support services to help you deliver the best online experiences.